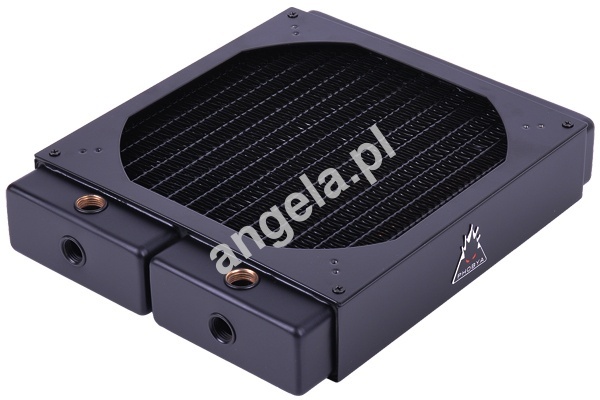 Phobya Xtreme 200 - V.2 - Full Copper :: ..:: Angela.pl ::..
Phobya Xtreme 200 - V.2 - Full Copper PROMOCJA! An additional new feature of the now completely black radiator are now the caps in brass black nickel. The sides on this version are mounted with a more complicated prodecdure which means that they are a bit more expensive but also look just great! More than that the V2 has not only copper fins, but also copper channels and copper chambers only the threads are made of brass. For those who what copper-only watersystems this radiator is the first choice. Please note that on some cases additional modifications may be needed. More information can be found here in case-radiator compatibility list for download. This radiator has been reviewed by the ''Bastelorakel'' here. Please note: Always consider the fan thickness when mounting the radiator with or without a fan. Depending on the application different screws may be required! The reddish brown "stains" on the fins is no rust. Please note that this is a copper radiator and the note: "The whole radiator was coated with a robust black lacquer. The fins are coated with a thinner layer to improve the appearance without compromising cooling performance.". The lacquer coat is made from the same material, hence the reddish-brown "stains". Attention: The radiator can be damaged, if the screws are screwed too deep. Please pay attention to the right length of the screws. The screws do not have the same size in every delivery. Note: To avoid storage or manufacture-related residues in the circulation, Please rinse the radiator completely before assembling.